Hey, there! Welcome to my stop on the Trinity Stamps Winter Release hop! I hope that you're enjoying the inspiration so far! I'm using the Rhino Bird Day set today because - well - its just the cutest. Before we dive in, let's go over the prizes to be won on our 2 day hop! The hop is 2 days; today, Friday November 2nd and Monday, November 5th. Be sure to comment on each blog post to be entered to win one of FIVE Trinity Stamps prize packs valued over $25! There are lots of chances to win, so be sure to hop along with us and come back on Monday. 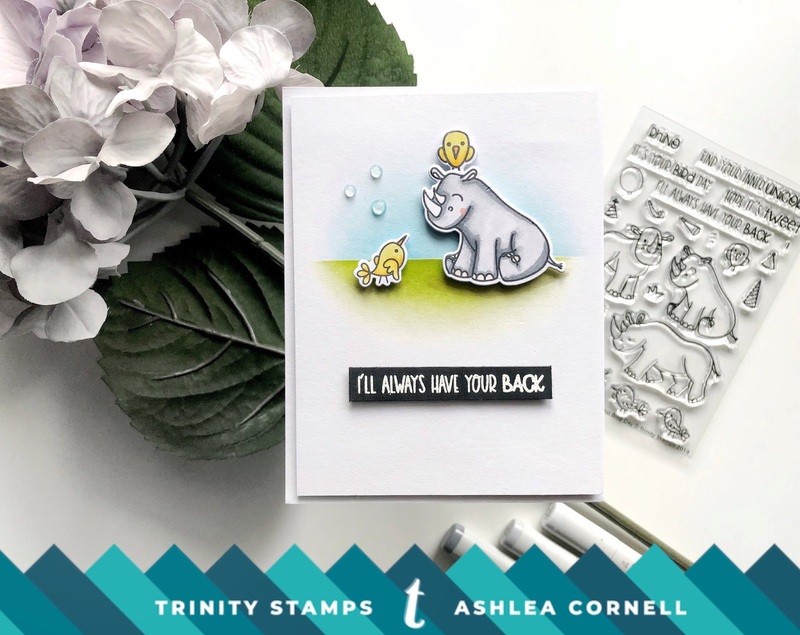 The winner will be announced on the Trinity Stamps blog on November 10th. Okee dokee, let's get into the card! I absolutely love the characters in this set so I kept it nice and simple to be sure the focus was on them. 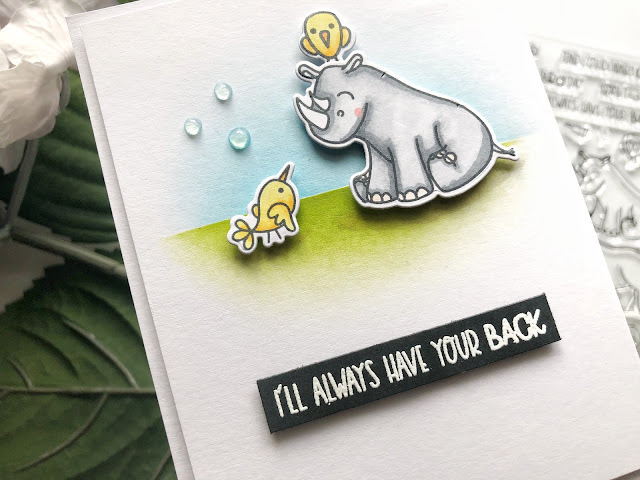 The sentiment "I'll always have your back" jumped right out at me so I knew I wanted to put one of these little birds on one of the rhino's backs. I know, I know, he's on his head! But, when I was putting it all together that's what worked best in my opinion. He's got his back and his head! Ha. I stamped these three critters out using my MISTI onto a piece of 80lb card stock using Momento Tuxedo Black ink and colored them in using Copic markers (list below). I then cut them out using their coordinating dies and set them aside. For the scene, I kept it super simple, I placed a piece of blue masking tape across the top portion of the card and blended some Catherine Pooler ink in Lime Rickey in a downward motion to act as the grass. For the sky I used another piece of tape and blended upward with Catherine Pooler's It's A Boy ink. I adhered my critters to the scene using foam tape to give dimension to the card. I embossed my sentiment onto a piece of black card stock using white embossing powder and adhered that with foam tape as well. I finally adhered it all to an A2 sized card base and that's it! I hope that you've enjoyed learning a little about how I created this simple and cute card using the new Rhino Bird Day set! Please continue hopping along and comment to win! I'll see you very soon! 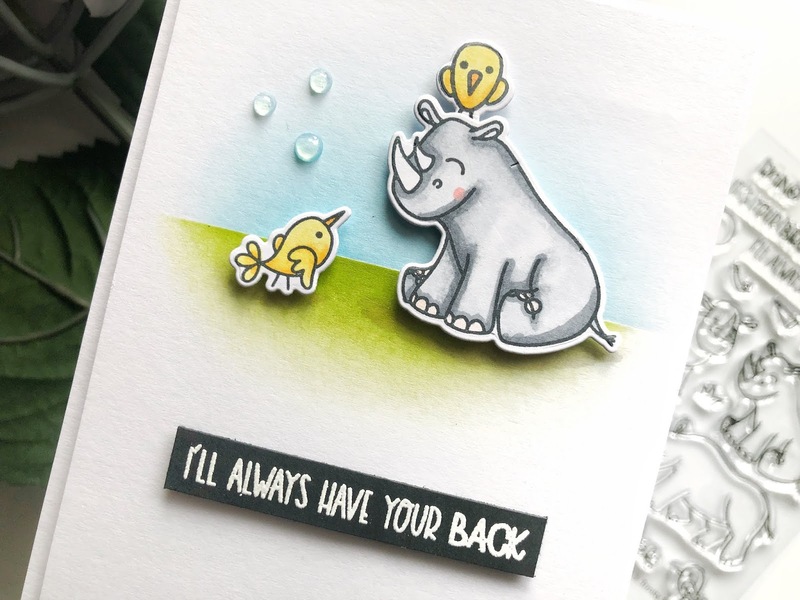 Love the fun sentiment with adorable creation! Oh what a sweet card! Lovely scene and coloring. Great coloring. That Rhino stamp is great. 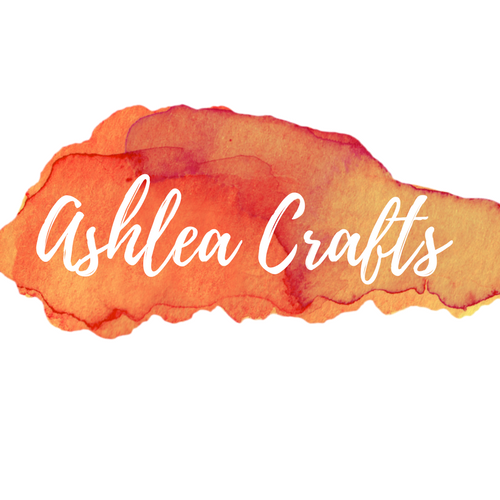 Great little scene Ashlea!! Perfectly executed coloring. love the scene and the way you matched it with the sentiment! Super cute stamps and fab card! Very cute, I like this adorable stamp set, and you made an adorable card with it! Thanks for the inspiration! This is precious!!! You rocked that stamp set. 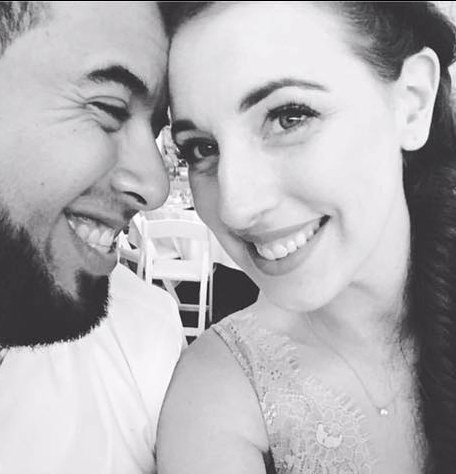 Adorable!! The rhino and birdies are so cute!! AWWWWWW what a precious card! That Rhino with those little birds is just so adorable! I also really love your blended background! And that sentiment is just so perfect for the card too! So cute with these critters and I like the colors. Such an adorable stamp set! I love that you've kept the card simple to keep the focus on the cute critters. Lovely ink blending and sentiment! This spotlight scene is fantastic and a great showcase of these new products. Thanks for sharing your creativity. Adorable card! Love these sweet critters!